England spinner Monty Panesar says he made the right decision in joining Essex permanently during the winter. The 32-year-old, who left Sussex after disciplinary problems, took his best Essex figures of 6-111 this week. "The county wanted me to come here and I always feel you go to a place where people want you," he told BBC Essex. Monty Panesar has taken 28 County Championship wickets at an average of 30.42 from 10 matches since joining last summer. "I like the setup and I like the rich history of international cricketers that have been here. It felt like this was the right place for me." 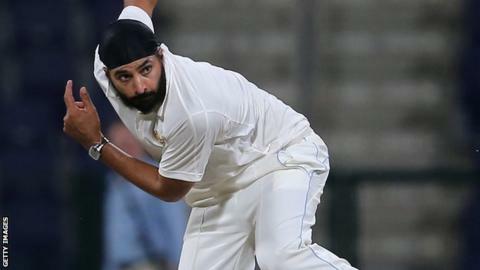 Panesar joined Essex on loan at the back end of last season, following an internal investigation at Sussex after he was fined by police for urinating on nightclub bouncers. He went on to take 14 County Championship wickets in six matches for Essex last summer and signed a two-year deal in October. His six-wicket haul against Leicestershire this week has given the Chelmsford side hope of rescuing a draw on Wednesday's final day of play. It will have also been noticed by England's selectors, with the left-arm spinner bidding to be in the squad for upcoming Test matches against Sri Lanka and India. Essex have made a good start to their Division Two campaign, winning one and drawing two, with Panesar contributing 10 wickets. "When you're a new signing at a club you are under pressure. You want to contribute to Essex winning," he said. "We started off well against Derbyshire, have had a couple of draws, but have put ourselves into positions where we can win."